Joshua Roman has earned an international reputation for his wide-ranging repertoire, a commitment to communicating the essence of music in visionary ways, artistic leadership and versatility. As well as being a celebrated performer, he is recognized as an accomplished composer and curator, and was named a TED Senior Fellow in 2015. During the 17-18 season, Roman will make his Detroit Symphony Orchestra debut, and perform his own Cello Concerto, Awakening, with the Princeton Symphony in collaboration with conductor Teddy Abrams. In Europe, Roman will perform one of his favorite 20th Century Cello Concertos, that of Polish composer Witold Lutoslawski,with the Szczecin Philharmonic of Poland. Other season highlights include performances of Tornado with the JACK Quartet with San Francisco Performances, Town Hall Seattle, Interlochen and numerous presenters throughout the country. Notable events from the 16-17 season include the premiere of Tornado, a new work composed by Joshua Roman and commissioned by the Music Academy of the West and Town Hall Seattle. The lauded premiere took place with the JACK Quartet at the Music Academy of the West in June of 2017. He also gave his debut at the Spoleto Festival in Charleston, comprised of not only performances with high caliber musicians from the St. Lawrence String Quartet and other corners of the chamber music world, but a performance of his solo piece Riding Light. Orchestral highlights of the season included performances of the Mason Bates Cello Concerto with the Portland, Berkeley, Spokane, and Memphis Symphonies. The concerto is dedicated to the cellist, who gave its “world-class world premiere” (Seattle Times) with the Seattle Symphony in 2014, and has since performed it with orchestras around the U.S. At TED2017 in Vancouver, Roman opened the conference during its first-ever live simulcast to movie theaters around the world with a collaborative music and dance piece created and danced by Huang Yi, with the industrial robot KUKA as dance partner, followed by an original composition to kickstart the first session of speakers. In November of 2016, Roman’s musical response to the tension around the U.S. Presidential election – “Let’s Take A Breath” – brought almost one million live viewers to TED’s Facebook page to hear his performance the complete Six Suites for Solo Cello by J.S. Bach. Prior seasons have seen Roman premiere Awakening, his own Cello Concerto, with the Illinois Philharmonic Orchestra, and subsequently perform it with ProMusica Chamber Orchestra; make his debut with the Pittsburgh Symphony Orchestra playing Dvorák’s Cello Concerto; give a solo performance on the TED2015 main stage; perform a program of chamber works by Lera Auerbach at San Francisco Performances with Auerbach and violinist Philippe Quint; and make appearances with the Columbus, Fort Worth, New World, Seattle Symphonies as well as with the Moscow State Symphony Orchestra and BBC Scottish Symphony Orchestra. He also served as Alumnus-in-Residence at the prestigious Music Academy of the West in Santa Barbara. Roman has demonstrated inspirational artistic leadership throughout his career. As Artistic Director of TownMusic in Seattle he has showcased his own eclectic musical influences and chamber music favorites, while also promoting newly commissioned works. Under his direction, the series has offered world premieres of compositions by some of today’s brightest young composers and performances by cutting-edge ensembles. In the 2015-16 season at TownMusic he presented his own song cycle, … we do it to one another, based on Tracy K. Smith’s book of poems Life on Mars, with soprano Jessica Rivera. He has also recently been appointed the inaugural Artistic Advisor of award-winning contemporary streaming channel Second Inversion, launched by Seattle’s KING-FM to cultivate the next generation of classical audiences. In the summer of 2016 the cellist took on the role of Creative Partner with the Colorado Music Festival & Center for Musical Arts. The same organization sponsored him in April 2016 at the 68th Annual Conference on World Affairs on the University of Colorado campus, where he contributed his innovative ideas about how classical music is conceived and presented. Roman performed at the Kennedy Center Arts Summit that same month and was a member of the 2016 Kennedy Center Honors artists committee. Roman’s cultural leadership includes using digital platforms to harness new audiences. 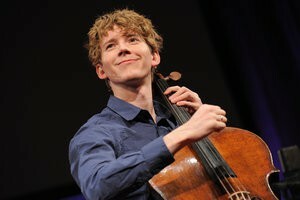 In 2009 he developed “The Popper Project,” performing, recording and uploading the complete etudes from David Popper’s High School of Cello Playing to his dedicated YouTube channel (youtube.com/joshuaromancello). In his latest YouTube project, “Everyday Bach,” Roman performs Bach’s cello suites in beautiful settings around the world. He has collaborated with photographer Chase Jarvis on Nikon video projects, and Paste magazine singled out Roman and DJ Spooky for their cello and iPad cover of Radiohead’s “Everything in Its Right Place,” created for the Voice Project. For his creative initiatives on behalf of classical music, Roman was named a TED Fellow in 2011, joining a select group of next-generation innovators who show potential to positively affect the world. He acted as curator for an outdoor amphitheater performance at the TED Summit in Banff in the Canadian Rockies this past summer. Beyond these initiatives, Roman’s adventurous spirit has led to collaborations with artists outside the music community, including his co-creation of “On Grace” with Tony Award-nominated actress Anna Deavere Smith, a work for actor and cello which premiered in February 2012 at San Francisco’s Grace Cathedral. His outreach endeavors have taken him to Uganda with his violin-playing siblings, where they played chamber music in schools, HIV/AIDS centers and displacement camps, communicating a message of hope through music. Before embarking on a solo career, Roman spent two seasons as principal cellist of the Seattle Symphony, a position he won in 2006 at the age of 22. Since that time he has appeared as a soloist with the San Francisco Symphony, Los Angeles Philharmonic, Mariinsky Orchestra, New World Symphony, Alabama Symphony, and Orquesta Sinfónica Nacional del Ecuador, among many others. An active chamber musician, Roman has collaborated with established artists such as Andrius Zlabys, Cho-Liang Lin, Assad Brothers, Earl Carlyss, Christian Zacharias and Yo-Yo Ma, as well as other dynamic young soloists and performers from New York’s vibrant music scene, including the JACK Quartet, Talea Ensemble, Derek Bermel and the Enso String Quartet. A native of Oklahoma City, Roman began playing the cello at the age of three on a quarter-size instrument, and gave his first public recital at age ten. Home-schooled until he was 16, he then pursued his musical studies at the Cleveland Institute of Music with Richard Aaron. He received his Bachelor’s Degree in Cello Performance in 2004, and his Master’s in 2005, as a student of Desmond Hoebig, former principal cellist of the Cleveland Orchestra. Roman is grateful for the loan of an 1899 cello by Giulio Degani of Venice. © 2013-2017 California Chamber Orchestra. All rights reserved.